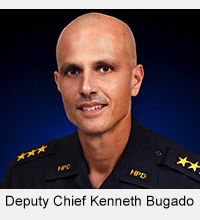 Big Island Police are investigating a robbery which occurred at Ken’s House of Pancakes in Hilo, Hawaii. 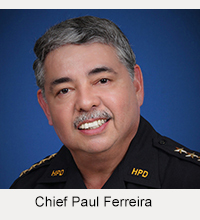 On November 8, 2006 at 3:24 a.m., South Hilo Patrol Officers responded to the report of a theft at Ken’s House of Pancakes at 1730 Kamehameha Avenue. Upon arrival it was determined that a male party had entered the restaurant at about 3:15 a.m., and after asking the cashier for change he reached over the counter, into the cash register and removed currency from the register. As the cashier attempted to deter the thief his hand was brushed off by the suspect causing this incident to be classified as a robbery. Witnesses describe the suspect as a local male in his 30’s, bald or very short hair, about 6’1″ tall and 230 pounds, he was last seen wearing a green long sleeve T-shirt, blue shorts and a dark color beanie cap. He may have left the area in a dark color compact sedan with a white color sticker on the front windshield. Anyone with information in regards to this incident is asked to call Officer Anson Caceres of the South Hilo Patrol at 961-2213, or the police non-emergency telephone number at 935-3311.